Donald Trump has proposed profiling Muslim Americans and shutting down mosques. He claims that Muslim "hatred is beyond comprehension." But the truth is that Muslim Americans are not only integrating into U.S. society, but are actually more opposed to violence and more tolerant in many ways than many other Americans. Muslims are similar to other religious Americans. Pew's major survey of Muslims in 2011 found that religion was equally important to Christian and Muslim Americans. Christians and Muslims also attend religious services with about the same frequency. Only 35 percent of Muslims saw their religion as the only true faith, compared to 30 percent of Christians. 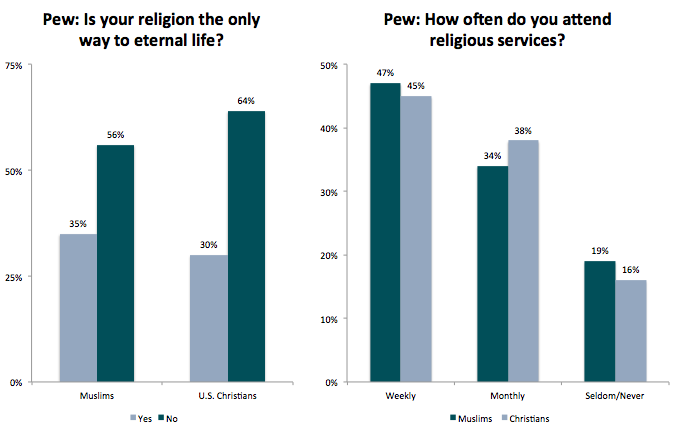 Like 64 percent of U.S. Christians, a majority of Muslim Americans think different religions can lead to eternal life. Pew even found that Muslims are much less prone to scriptural literalism than Evangelicals. Most American Muslims arrived in the United States after 1990, yet they are almost as likely as Christians to prioritize their American identity over their religious identity. 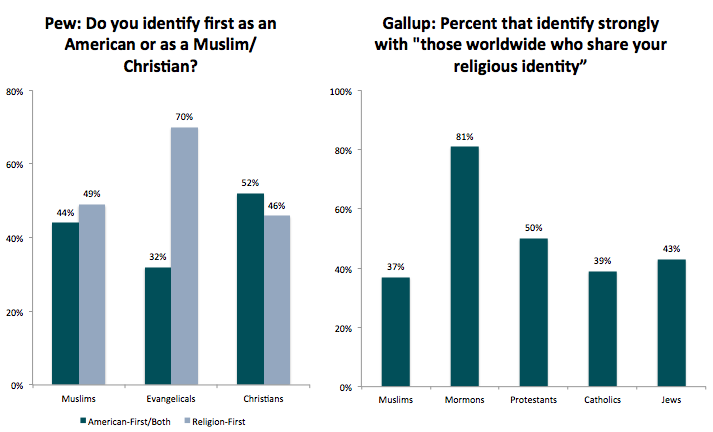 As matter of fact, Muslims are much more likely than Evangelical Christians to see themselves as Americans first. More than two-thirds of Evangelicals identify as Christians first and Americans second. The fear that Muslim Americans might be more loyal to other Muslims around the world than they are to their own country is unfounded. Gallup's major survey of American Muslims in 2010 found that Muslim Americans were the least likely of any American religious group to strongly identify with their coreligionists abroad. Far from being clannish, Pew found that 93 percent of Muslim Americans had close non-Muslim friends. 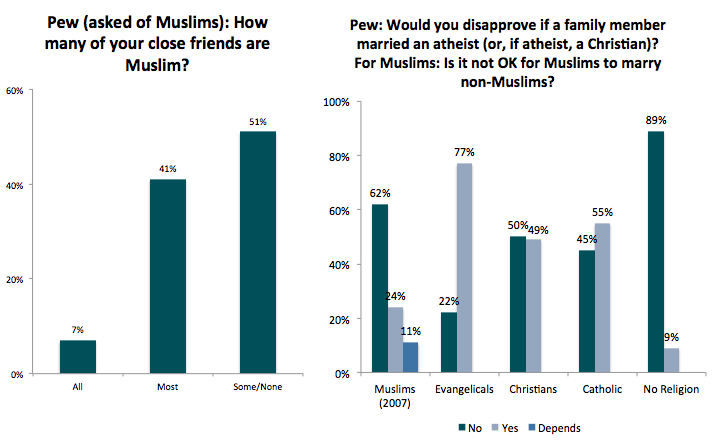 A majority reported that most of their friends were non-Muslim. At the same time, 92 percent of U.S. Muslims don't oppose women working outside the home (98 percent of Americans agree). Pew also found that 62 percent of Muslims said they were "OK" with Muslims marrying non-Muslims, and another 11 percent said it depends. American Christians were not asked this exact question, but in 2014, Pew found that 77 percent of white Evangelicals would be unhappy if an immediate family member married an atheist. Pew finds that U.S. Muslims are politically moderate (38% moderate; 27% liberal; 25% conservative). They were also swing voters in the 2000s, first going strongly for George W. Bush in 2000 before flipping to John Kerry and Democrats since 2004. While there are no good polls on the attitude of American Muslims toward Sharia religious law,* U.S. Muslims score higher than most other believers on Gallup's "religious tolerance" index. The index categorizes individuals as either "isolated," "tolerant," or "integrated," based on their level of agreement with five statements about other faiths. Not all Americans share Muslim Americans' openness to other faiths. In fact, recent Public Policy Polling (PPP) polls found many Republicans in Iowa, North Carolina, and New Hampshire believe Islam should be banned. 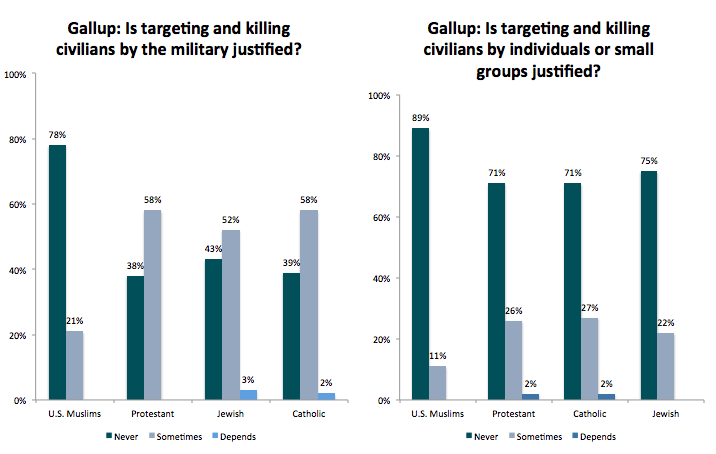 In 2010, Gallup also asked whether "targeting and killing civilians by the military" can be justified. U.S. Muslims were the only religious group that opposed such targeting. Protestants, Jews, and Catholics believed it could be justified. Muslim Americans were also the most strongly opposed of any religious group to "targeting and killing by individuals or small groups." Catholics, Protestants, and Jews were all more than twice as likely to support civilian strikes. 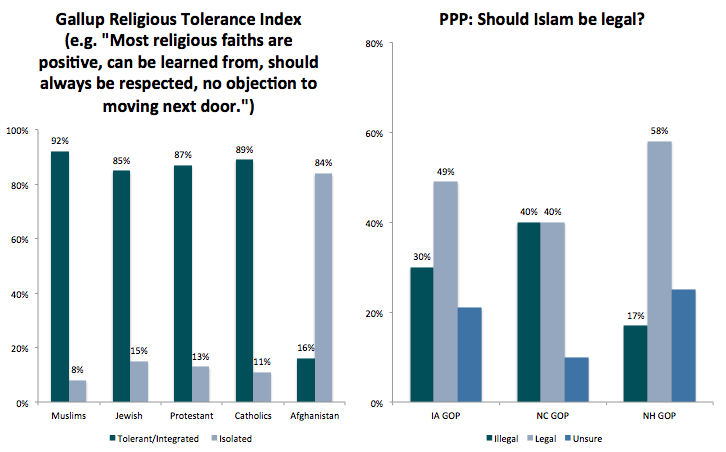 Internationally, Muslim views are more varied. Gallup found strong support for Sharia law in several countries, and Pew found support for violence against civilians "in defense of Islam" at high levels in several Middle Eastern countries. This suggests that either the Muslims moving to the U.S. are from the more moderate Muslim communities abroad or that they assimilate quickly. A combination of both is likely. Islamic totalitarians, such as ISIS, consider it a form of apostasy to emigrate from a Muslim society to a secular one. Meanwhile, in America, young Muslims are pioneering more liberal forms of Islam-or abandoning the faith. Even if 5 percent of U.S. Muslims view al-Qaeda favorably, does that mean we will face a constant barrage of attacks? Actually no. It's possible for large numbers of people to hold dangerous views on violence without acting on them, as evidenced above. 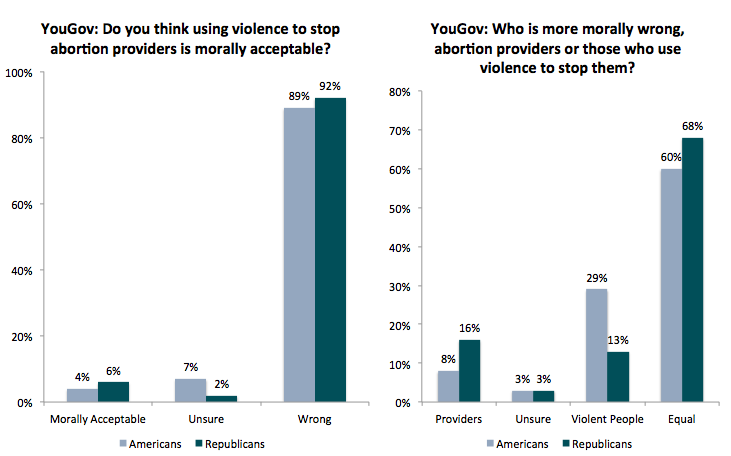 But here's more evidence: according to a YouGov poll this month, some 4 percent of Americans supportattacks on abortion providers. Another 7 percent of Americans are unsure if those attacks are immoral. There have been two dozen murders or attempted murders, as well as many other attacks by anti-abortion extremists since 1993, but we understand that nearly all pro-life proponents oppose this kind of violence and those that don't would never act on their views. Why don't some people understand that the same is true for Muslims? The problem is that 83 percent of Americans dismiss violence by Christians as not being committed by "real" Christians, while only 48 percent do the same for Muslims. But the unpleasant reality is that other ideologies are also subject to distortion by violent extremists. The New America Foundation, for instance, finds that various ideologies that it identifies as "right-wing" have been responsible for 18 instances of deadly attacks and 48 deaths since 9/11, compared to 9 attacks and 45 deaths caused by jihadists. Americans simply should not let their lives be dictated by a fear of terrorism of any kind. As security expert John Mueller has documented, Americans are more likely to be killed by almost anything else over the last fifty years. Americans murdered more people on any two days last year than were killed by terrorists in the last 10 years. Shutting down mosques and banning Muslims will not make America any safer. Rather than treating them as enemies, America should see Muslim Americans as allies in our fight for freedom and peace. *Frank Gaffney, the conspiracy theorist at his Center for Security Policy, has online "polls" from "Muslims" that are bogus, as has been explained by others. This post originally appeared on NiskanenCenter.org.